Register before this workshop gets filled up! Limited space available. **Register with a friend and take an extra $5 off for you and a friend. Separate registrations needed. Please provide name of friend to receive discount. WHO: This workshop is for you if you're tired of being so tired! You work hard, are always giving of yourself and your time to others, and maybe you want to say "No" but don't feel comfortable doing so. You may neglect your own needs and self-care, therefore feeling stressed on a pretty regular basis, and possibly feeling unmotivated, anxious, and even depressed. If you think you could use some time with like-minded women to unplug for 2 1/2 hours, enjoy the moment in a more mindful way utilizing your senses, take some time to reflect in a journal, create a scented lotion to experience on the spot and take home with you, learn about homeopathic remedies that you can use too reduce overall stress, receive the relaxation benefits of a guided meditation, and learn about how to set healthy boundaries, then registering for this workshop could be just what you need! WHY: You deserve to feel more relaxed, balanced, and in control of your own life! You deserve to live your life more in the moment and feel that you're getting the same love and attention that you give to others. Sometimes we have to drop everything else in order to care for ourselves. Experiencing what it feels like to do this, as well as learning new information, tips, and strategies to carry over into your everyday life can help immensely with prevent future stress and burnout. ** Please note that this is not therapy or medical advice. Please consult with your physician if you feel that your health is being effected by your stress level. Attending this workshop does not constitute a therapeutic or working relationship with Marni Goldberg, LMFT, LPCC, or Homeopathic practitioner Samantha Conboy, CCH. This workshop is not appropriate for those who are currently in crisis. Please seek medical attention if needed. We are asking for 24 hours notice if you will not be able to attend the workshop. Please email us to notify us at HealingWorkshop1@gmail.com. 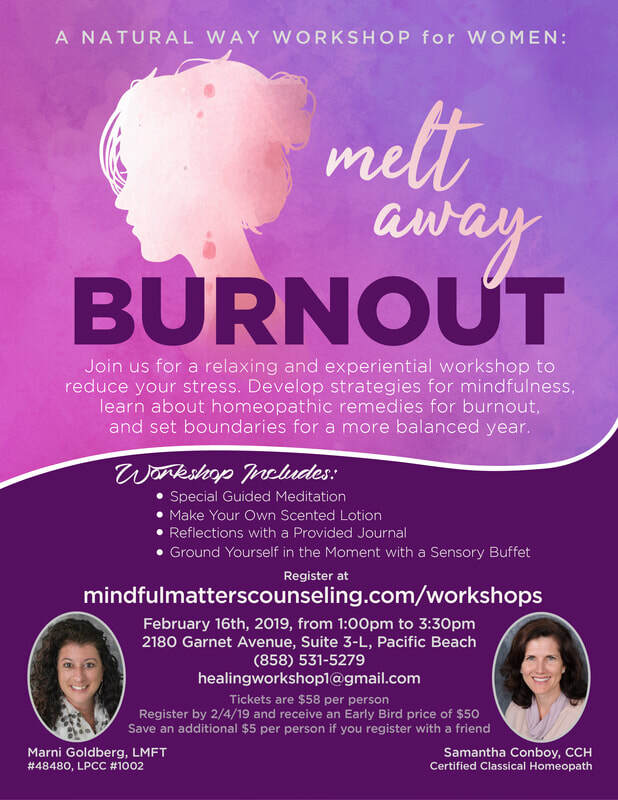 If you need to cancel the day of the workshop, please contact us as soon as you can so that we can discuss options, including the possibility of carrying the fee over to a future workshop or service by Marni and/or Samantha. You do not need to bring your printed ticket with you. We will have a list of the attendees at the door. How can I get in touch with the facilitators? Samantha is a nationally certified classical homeopath with over 9 years of clinical experience. She graduated from a 3 year program at the Homeopathic Academy of Southern California. Samantha also has a Masters of Arts in Educational Technology and a Bachelor of Science in Business Management. Samantha is the President of the Council for Homeopathic Certification. She loves helping women with hormonal, digestive and urinary complaints. She is a mother of two. ​Marni is a Licensed Psychotherapist and owner of Mindful Matters Counseling in Pacific Beach. She provides individual, group, and family therapy to tweens, teens, young adults, and families for life challenges including anxiety, mild depression, life transitions, healthy communication, high sensitivity, and general life dissatisfaction. She understands the toll that excessive amounts of stress and burnout can bring to people, and she's passionate about helping people learn how to live life more mindfully. She loves to learn and grow as a person and Clinician, and is very excited to be bringing hypnotherapy to her practice very soon. Are you up in the middle of the night, wondering how to quiet your mind? Check out our video below and register while there's still space available! 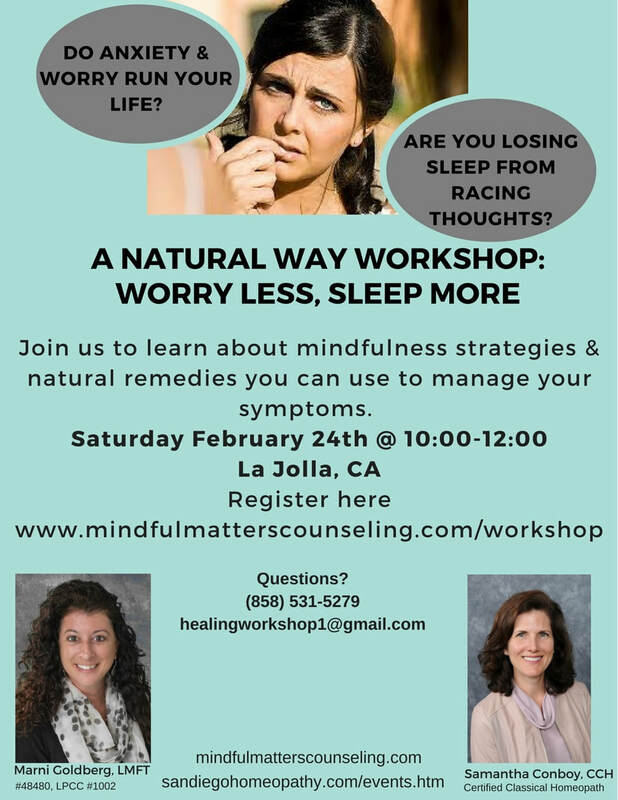 WHO: This workshop is for you if you experience anxiety, racing thoughts, excessive worrying, and may also have trouble sleeping as a result. If you're frustrated with feeling exhausted and having restless nights, or having endless thoughts swimming around in your head when you lay down to sleep, you can benefit from learning Mindfulness techniques and homeopathic remedies proven to be effective for these challenges. WHY: You deserve to feel more relaxed and at peace! You deserve to live your life more in the moment and not feel "stuck in your head" so frequently. Sleep is important! We want you to get more quality sleep and reduce, or even end, the ruminating and stressful thoughts. If it appeals to you to better understand how anxiety is manifesting in your body, and to learn ways to calm yourself and reduce your stress and insomnia, then it sounds like you're in the right place. ** Please note that this is not therapy or medical advice. Please consult with your physician if you feel that your health is being effected by your anxiety and/or insomnia. Attending this workshop does not constitute a therapeutic or working relationship with Marni Goldberg, LMFT, LPCC, or Homeopathic practitioner Samantha Conboy, CCH. This workshop is not appropriate for those who are currently in crisis. Please seek medical attention if needed. Samantha is a nationally certified classical homeopath with over 8 years of clinical experience. She graduated from a 3 year program at the Homeopathic Academy of Southern California. Samantha also has a Masters of Arts in Educational Technology and a Bachelor of Science in Business Management. Samantha is the President of the Council for Homeopathic Certification. She loves helping women with hormonal, digestive and urinary complaints. She is a mother of two. ​Marni is a Licensed Therapist and owner of Mindful Matters Counseling in La Jolla. She provides individual, group, and family therapy to tweens, teens, young adults, and families for life challenges including anxiety, mild depression, life transitions, healthy communication, and general life dissatisfaction. She's able to relate to many of her clients' struggles with excessive worrying and anxiety, and therefore has a passion for helping people to reduce their troubling symptoms and live more Mindfully. WHO: You tend to be a more sensitive type of woman, who has been known to wear her heart on her sleeve and dive into dating and/or relationships. You find yourself getting attached quickly, and anxiety arises as you wait to hear from the person who's caught your eye. It may be difficult for you to date casually because of the strong feelings that develop, and the whole process may feel very intense to you. You crave deep connections but find yourself either scaring others away, running away yourself, or fearing that you're "too much." WHY: You want to understand yourself a little better in terms of your dating patterns, and feel more relaxed and confident in the process of dating so that you can maintain a healthy life balance and continue to "feel like yourself" while putting your best foot forward. You want to better understand how you can use your intuition to quickly screen for the best potential matches, and stop wasting time on those that have a bunch of red flags. Join this fun, informative, and light-hearted event where we'll all share stories and connect with like-minded (and like-hearted) women who are trying to best navigate the dating scene while being true to themselves. We hope for you to walk away feeling better informed about your own needs and challenges while dating as a sensitive person. Do you want to maintain your own life balance, boundaries, and feeling of confidence while exploring relationships with others? Then this workshop is for you!! We are asking for 24 hours notice if you will not be able to attend the workshop. Please email us to notify us at healingworkshop1@gmail.com. If you need to cancel the day of the workshop, please contact us as soon as you can so that we can discuss options, including the possibility of carrying the fee over to a future workshop or service by Marni or Kelly. 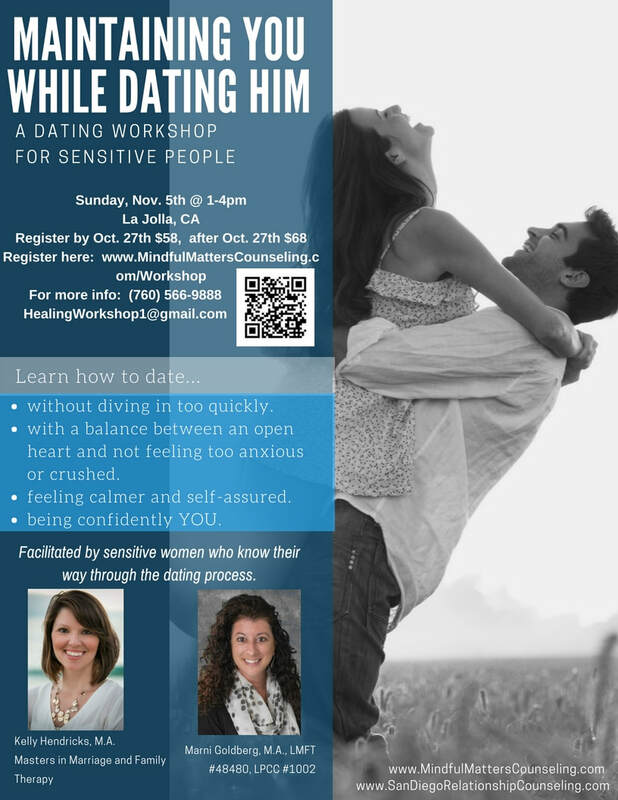 This workshop is being facilitated by Marni Goldberg, Licensed Marriage and Family Therapist and Licensed Professional Clinical Counselor, and owner of Mindful Matters Counseling in La Jolla, along with Kelly Hendricks, who holds a Masters Degree in Marriage and Family Therapy and has a passion for helping women navigate the dating process. Marni provides individual, group, and family therapy to tweens, teens, young adults, and families for life challenges including anxiety, mild depression, life transitions, healthy communication, and general life dissatisfaction. Kelly provides individual and couples counseling in San Diego as well. Please check out our websites below for further information about our backgrounds, experience, and client populations that we both work with. Please also note that we practice separately in San Diego and our practices are not affiliated with each other in any way.